Category: Hikarimono (silver, shiny fish). Season: best in the spring. 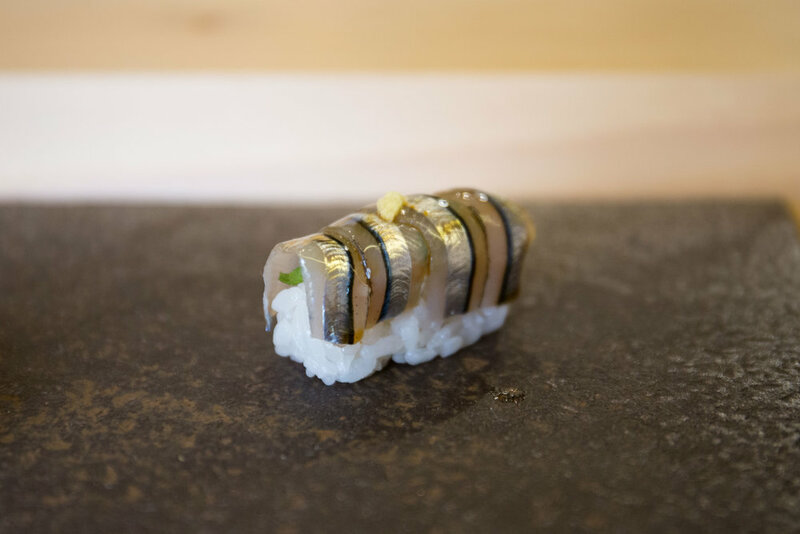 Kibinago is not a traditional Edomae-zushi topping. In Japan, it is typically served as sashimi or grilled, but is rarely used as sushidane. The appearance is not unlike that of sayori, although I personally much prefer sayori's depth of flavor. In the photo above, several fillets of kibinago are placed on top of the shari, and a shiso leaf is placed between the shari and the fish. A dab of grated ginger and some nikiri is then applied.